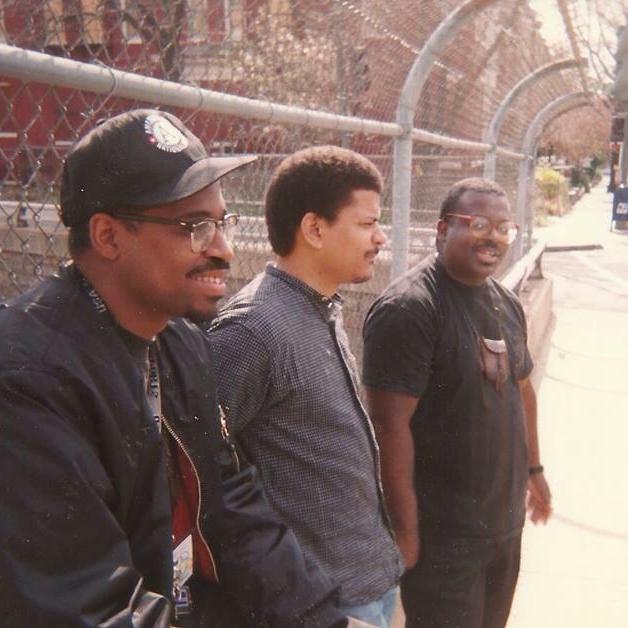 The 8Rock Collective was formed in the early 90s after the opening of the 8Rock African Cultural Arts Center in Anacostia. 8Rock Arts Center was the brainchild of community activist Peter Clare and writer Judy Cohall. The idea was to provide a space for Black artists to present their works and to help economically energize a part of the city long-neglected by the mainstream arts community. The first fundraiser for the new facility featured poet Reuben Jackson and the first poet to be featured in the newly opened facility some months later was Joel Dias-Porter aka DJ Renegade. I was on the board of 8Rock and volunteered to run its open mics and featured poetry series. We had a house band that allowed area musicians from all genres to sit in on jam sessions, we had the area’s first open mic Hip Hop sessions, run first by rapper/artist Terrance Nicholson, and our first play was written, directed and produced by award-winning poet Gary Lilley. From left to right: Joel Dias-Porter, Brian Gilmore, Kenneth Carroll, on the New York Avenue overpass at N. Capitol Street NW. Photo by Brandon D. Johnson, 1995 or 1996. The 8Rock Collective came out of three friends, myself, Brian Gilmore and DJ Renegade simply enjoying each other’s works and reflected our eagerness to find venues to share that work. Our styles and voices were very different but with similar urges and appreciations, and perhaps goals. We all wanted to illuminate Black arts and Black life and the continuing struggle against racist oppression. All three of us were devotees of jazz and blues and performed often with area musicians. The three of us had performed dozens of times together without a group name, and dozens of times since where we haven’t used the name. The 8Rock Collective was more a loose aggregation than a real group. We did a lot of local gigs a few national gigs at colleges and cultural centers on the eastern seaboard. The height might have been our performance at Amiri Baraka‘s home, in a performance space he called Kimako’s Blues People, named after his slain sister. DJ Renegade was an emerging voice back then, very into the mechanics, the theory and aesthetics of the canon. We would often pick him up at his then home, the 3rd Street Homeless Shelter (now the Mitch Snyder Center) where he lived as an effort to be in close proximity to the Library of Congress where he studied every day. Brian had recently graduated law school and was working around the corner from 8Rock at the Neighborhood Legal Center and had a new book out published by Haki Madhubuti‘s Third World Press. I had recently left my corporate gig to “become a writer” and was freelancing with any publication that would take my work. The 8Rock Collective was more a loose aggregation of guys who appreciated each other’s writings and politics. Some of our greatest performances occurred during our pre- or post-performance debates, which sometimes occurred onstage in the middle of somebody’s poem! 8Rock Cultural Center was far more significant than was the 8Rock Collective. 8Rock (the name derives from Zora Neal Hurston‘s moniker for “race men”) birthed important spoken word institutions like The Freestyle Union and It’s Your Mug, both launched by young women, Toni Blackman and Toni Asante Lightfoot, who attended our open mic sessions. Finally, 8Rock was significant because when Carolyn Forche tapped me to be the new coordinator for the DC WritersCorps, I was able to hire almost all the poets and writers who I worked with at the 8Rock Center, including DJ Renegade and Brian Gilmore. Joel Dias Porter is now a poet/poker player who lives in New Jersey and plays at various casinos. He still performs, conducts workshops throughout the country and is still finding ways to blend various eclectic aesthetics from the canon and the Black musical/written tradition and continues to be widely published. Brian Gilmore is a law professor at Michigan State University and his articles on law and politics are syndicated across the US. He has two books of poetry that are still available. He lives in Michigan with his lovely wife and three amazing daughters. After running DC WritersCorps (or did it run me?) I began working with a series of out-of-school-time organizations that provide academic and college support for youth in east of the river wards. I currently work for UPO Youth Services Division. I don’t publish or perform as much as I spend most of my time with students, including my own two teenagers and my eldest son. I live in Michigan Park with my wife, who is also a playwright and a member of the Black Women’s Playwright group.